18 Mile: The Skunk is off! I was so so overtired last night that I promised myself that I was going to sleep in this morning/ after yesterday's skunkage I had enough. and I woke up on the reservation. 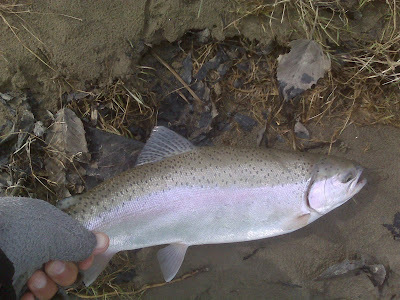 I proceeded to fish Lake Erie's Crown Jewel with out success for the first couple hours. But after moving around I hit pay dirt and got into them. They were fresh silver fish who liked to leap and cart wheel in the air. But oh no nothing can go perfectly right? The neoprenes began to leak again in another spot. Today I was wading up to my belly button and there was no getting around it. If I wanted to fish this spot. I needed to be in the water up my belly. I ignored the problem. I wasn't going to let it get me down. I put in about 5 hours and lugged my water logged waders back to my truck. It felt like I had two 25lb concrete blocks tied to my legs and I was getting a little cold. I got back to the truck soaking wet. The waders were turned upside down and emptied. The soaking socks were rung out and I squeezed as much water out of the sweats and long johns as possible. I got home and had a voice message message from my Cousin's son Justin asking if I wanted to go fishing with him and his grandfather/my uncle tomorrow. I stopped over there and accepted the invite. They want to go perch fishing at a local marina and with the waders drying out I said why not. I plan on centerpinning for perch with small jigs. Sometimes you have to pay it foward. As a child my uncle took me fishing quite a bit. I was a hyperactive brat as a child and he had the patience to take me fishing on the Cat and the 18. He also took me out to the inland trout streams as a child and up to Wellers Bay in Ontario. Those are the things you remember the most as a kid and I wasn't going to give up the opportunity to pass it on to the next generation. Justin is a horse of a kid. He is 12 or 13 and he looks like a 16 year old. I am definitely going to take him steelheading next season. He is a good kid and I want to start him out right. In a karmic response to my acceptance of their invitation. Justin's dad pulls into my uncle's drive way and offers to loan me his neoprenes for the rest of the season as he is in golfing mode already and doesn't plan to get out. And his foot just happens to be my size. See good things do happen to bad people! Perching tommorow and back to the the steel Friday. Good luck with the perch dinner! Somebody give me a report this weekend!